Bluff The Listener Our panelists read three stories about someone having a surprising problem with their pet, only one of which is true. Our panelists read three stories about someone having a surprising problem with their pet, only one of which is true. BILL KURTIS: Support for NPR comes from NPR stations, and the School of the New York Times, offering a two-week summer academy for high school students who want to live and learn in New York and Washington D.C. while studying with Times journalists. Application info at N-Y-T-E-D-U.com. Trader Joe's, with new, seasonally available products and new always available episodes of the podcast, Inside Trader Joe's. At Apple podcasts and where podcasts are found. More at Trader Joe's.com. And Sierra Nevada Brewing Company. Family owned, operated and argued over since 1980. Proud supporter of independent thought, whether that's online, over the air or in a bottle. More at SierraNevada.com. 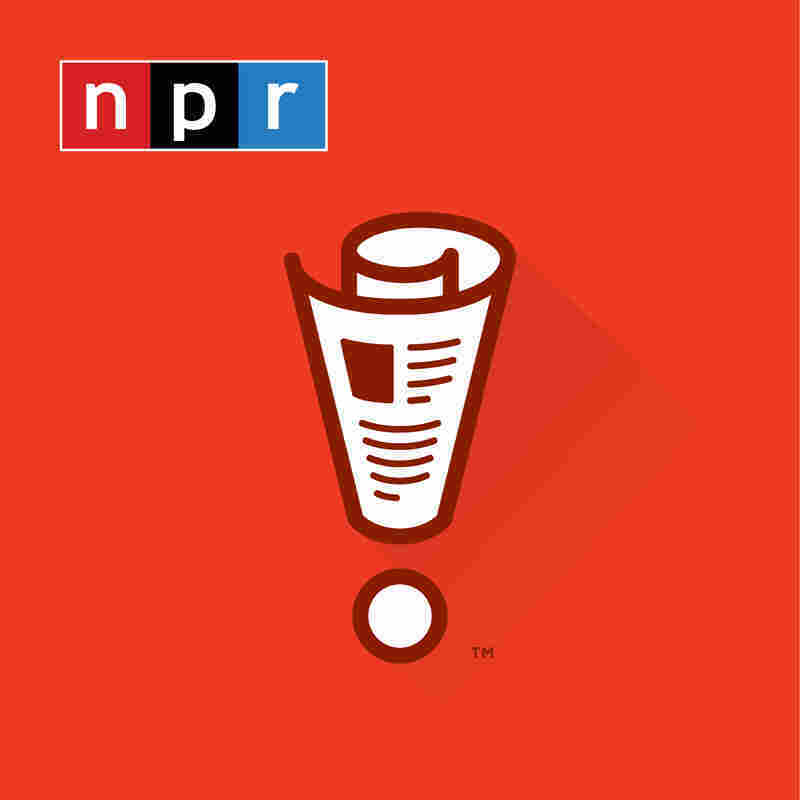 KURTIS: From NPR and WBEZ Chicago this is WAIT WAIT DON'T TELL ME, the NPR news quiz. I'm Bill Kurtis. We are playing this week with Maeve Higgins, Roxanne Roberts and Adam Felber. And here again is your host, at the Chase Bank Auditorium in downtown Chicago, Peter Sagal. Thank you Bill. Thank you so much. SAGAL: Right now it is time for the WAIT WAIT DON'T TELL ME, Bluff the Listener game. Call 1-888-WAIT WAIT to play our game on the air. Hi, you're on WAIT WAIT DON'T TELL ME. SAGAL: Where are you calling from, Glyn? SAGAL: Stone Harbor, N.J. Now I am - I will say a son of New Jersey, I'm not going to go so far as to say a proud one. But I don't know where Stone Harbor is, where is it? LEWIS: It's probably about 20 minutes north of Cape May. SAGAL: Oh, you're down there in South Jersey. And what do you do there? LEWIS: I have my own business. I maintain and repair boats. SAGAL: There are a lot of people who are boating in New Jersey? SAGAL: Yeah. And are most of them tossing bodies over the side? LEWIS: Well, I don't know about that. There has been stories. SAGAL: I bet. Well it's nice to have you with us, Glyn. You're going to play our game in which you must try to tell truth from fiction. What is the topic, Bill? SAGAL: Our beloved friends, pets. Who would undoubtedly eat us if they were just a little bit bigger. This week we had a story about somebody having a surprising problem with their animal companion. Our panelists are going to tell you about it. Pick the one who's telling the truth and you'll win the wait waiter of your choice on your voicemail. Ready to play? SAGAL: All right first let's hear from Adam Felber. ADAM FELBER: Rocco the African parrot already had a mouth that got him into trouble. He'd been kicked out of the National Animal Welfare Trust in Watford, England for his relentless, lascivious, obscene rants that disqualify one from polite company and qualify one for the U.S. presidency. FELBER: But one staffer, Marion Wischnewski relocated Rocco to her home. He picked up another bad habit that afflicts suburbanites, ordering unnecessary crap online through Amazon's Alexa. Wischnewski came home to find that Rocco had filled her virtual cart with strawberries, watermelon, raisins, broccoli and ice cream. So Polly doesn't in fact want a cracker which shouldn't surprise anyone. I mean, honestly when was the last time you really wanted a cracker. Anyway, Rocco also reportedly makes Alexa play a lot of very romantic music which some people find cute but to me it's quite obviously Alexa misinterpreting the same lewd crap that got Rocco kicked out of his last home. SAGAL: A parrot gets in trouble by ordering stuff from Amazon via Alexa. Your next story of mo' pets mo' problems comes from Roxanne Roberts. ROXANNE ROBERTS: For the past 17 years, farmer Joe Stanford has provided animals for the living creche at Richmond's St. Catharine's Catholic Church. To wit, one donkey, seven sheep, three goats, two llamas and most impressively an 8-foot camel. The display draws huge crowds and is one of the church's top annual fundraisers. But this year a black and white goat named Bob, adopted in June by Stanford's daughter as her personal pet, has taken away in the manger to heart. Bob has eaten not only hay provided for the animals but an Angel's tinsel halo, the hem of a wise man's robe and apparently even baby Jesus. ROBERTS: Who was sleeping on a bed of hay one night but gone the next morning except for a plastic foot next to a sleeping Bob. The church quickly replaced the baby doll but said the goat was a problem. Stanford disagreed. Quote, "Bob stays or all the animals go" he told the Deacons. God loves all creatures great and small. The goat is now too famous to kick out. One anonymous donor gave $1,000 to the church for quote, "All the Bobs of the world." SAGAL: A goat which, at least allegedly, ate the baby Jesus. Your last story of animal issues comes from Maeve Higgins. MAEVE HIGGINS: 32-year-old architect James Kennedy was thrilled to bring home his new rescue dog Tyler. He was all prepared with a new bed, treats and a welcome home Tyler banner which Tyler, sadly, could not read. HIGGINS: It all seemed fine until they went out for their first walk through the Upper West Side neighborhood. Tyler did not walk in a straight line. Instead, aggressively approaching every single person they passed, attempting to enter two bodegas, nearly every brownstone and engaging in an intense staring contest with a park bench. Tyler, it turned out had been a drug sniffing dog for the NYPD. HIGGINS: And pretty much everyone on Kennedy's block was holding. HIGGINS: It was exhausting said Kennedy. When we got home from that first walk Tyler barked at the oregano shaker until I opened it and allowed him to investigate the contents. At first many neighbors complained about the new resident. Quote, "I felt like I was being profiled" said Monica Blomquist, a 72-year-old white woman. HIGGINS: Who was stopped and sniffed by Tyler on her way home from picking up her medical marijuana prescription. HIGGINS: But now many parents on the block love Tyler, asking to borrow him for the occasional playdate with their kids backpacks. Kennedy is taking steps to ensure a happy retirement for Tyler, introducing him to new hobbies like just walking and fetch as he adjusts to life as a civilian. Kennedy says quote, "Tyler is part of the family now and I don't mind keeping my stash at work." SAGAL: cause a problem for its owner. Was it from Adam Felber, an African Grey parrot who learned how to order things on Amazon via Alexa. From Roxanne, a goat on a living nativity scene that ate a lot of things, including our lord and savior. Or from Maeve, a rescue dog that had been a drug sniffing dog and would not give that up. Which of these is the real story of a pet causing a problem? LEWIS: I've got to go with Adam's story. SAGAL: You're going to go with Adam's story of the parrot. LEWIS: Yes, I have my (unintelligible). SAGAL: That ordered stuff from Alexa. Well we spoke to somebody who was actually very familiar with this kind of animal to bring you the real story. JANET TRUMBULE: Rocco is an African Grey parrot and he has used his ability to talk to manipulate Alexa. SAGAL: That was Janet Trumbule - the executive director of administration at The Oasis, a parrot sanctuary in Arizona - talking about the shopaholic parrot. Congratulations. You were right, of course. SAGAL: You won a point for Adam just for being honest and you won our prize, the voice of anyone you like on your voicemail. Congratulations. LEWIS: Thank you very much. SAGAL: It has been. Thanks.